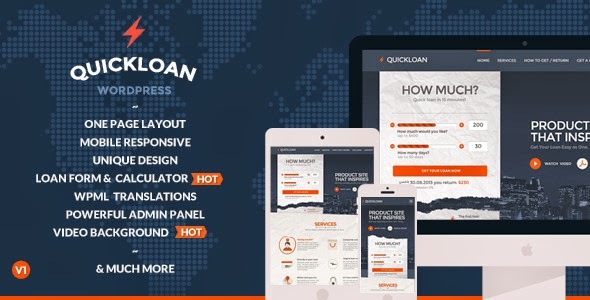 QuickLoan is responsive One Page WordPress Theme. It has unique design with loan form hot calculator and powerful admin panel. This is totally unique theme with unique loan calculator, using special formula you can set real loan number and percent. Video background and much more.. Item Reviewed: QuickLoan Responsive WordPress One Page Theme 9 out of 10 based on 10 ratings. 9 user reviews.